It has been a while since my last design blog, and I felt it was finally time to write one again. And since I just played through Detroit: Become Human, that’s what I decided to write about. First off, let me say that I quite liked the game. 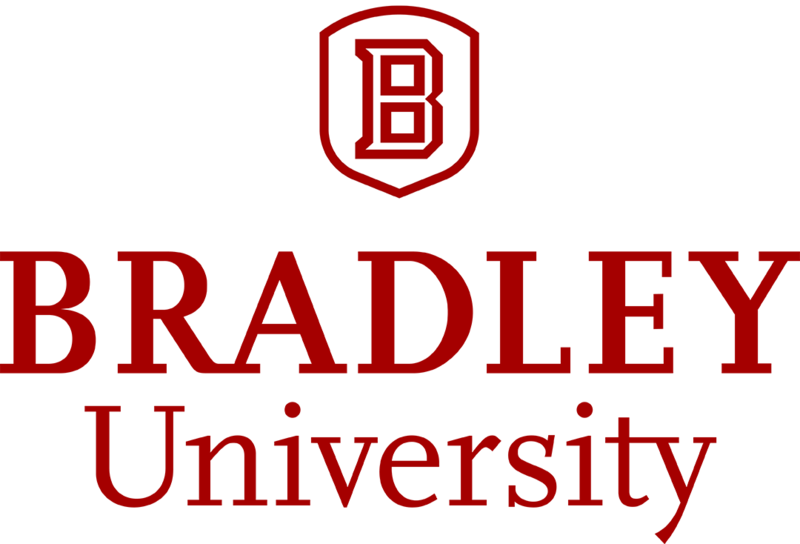 I had issues with how they tackled some of the themes (especially in regards to robots), and felt they could have taken some aspects of the world they created more seriously. What made up for the so-so narrative bits were the production value (such as some very cool environments), and the myriad of exciting scenarios. It’s not an easy feat to create scenes that are not just narratively compelling, but also engaging play-wise – especially not in the sort of story that Detroit tells. On top of this, the branching and the choice possibilities in Detroit are insane. It is a lengthy game, taking well over 10 hours to complete, and yet as the story unfolds there is a constant stream of differences that all depend on your previous choices. Everything to how crime scenes change to how characters make remarks depending on how you played some previous scene is amazingly well done. The scenes are constantly constructed from a wide array of options, but everything flows together into a coherent whole. Other branching games, such as Hidden Agenda, have a much more jarring presentation where the inserted lines and cuts in the flow are obvious. In Detroit, flow flaws are basically nonexistent. So, it is fair to say that production-wise Detroit is quite a achievement. However, the game starts to stumble as it tries to be just that – a game. 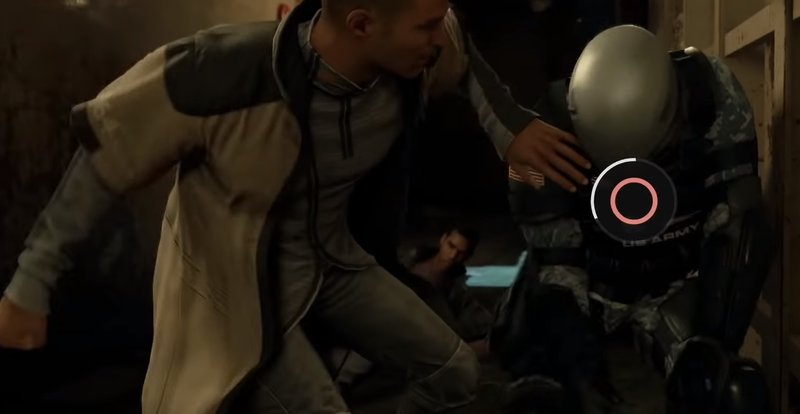 Just like with previous titles from Quantic Dream, Detroit tries to be what is essentially a playable movie. Mixing film and games gives rise to all sorts of interesting design decisions and issues – issues that are hard to see in other games. It is clear that Quantic Dream are aware of the flaws they have had in their previous games, and there are a bunch of new feature that try to address the issues. But with new features come new issues, and lots of juicy design lessons. In this blog post I will talk at length about affordance, then touch upon branching and themes. 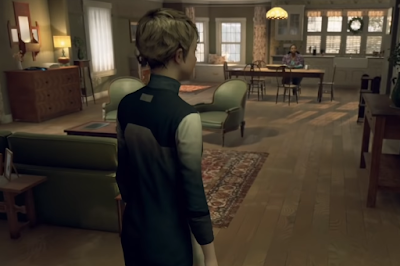 The first topic of this blog is how Detroit: Become Human handles affordance. The game takes place in one of the most challenging environments there is design-wise: inhabited real-life spaces. Spaces that contain a bunch of everyday items, such as drawers, pictures, tools, televisions, coffee cups, keyboards, clothes and so on and so forth. These are all objects we are not just accustomed to interact with – we also have expectations of their usage. As a player, you need to be able to figure out what objects you can interact with and in doing so you are constantly battling your ingrained notion of how these objects ought to work. 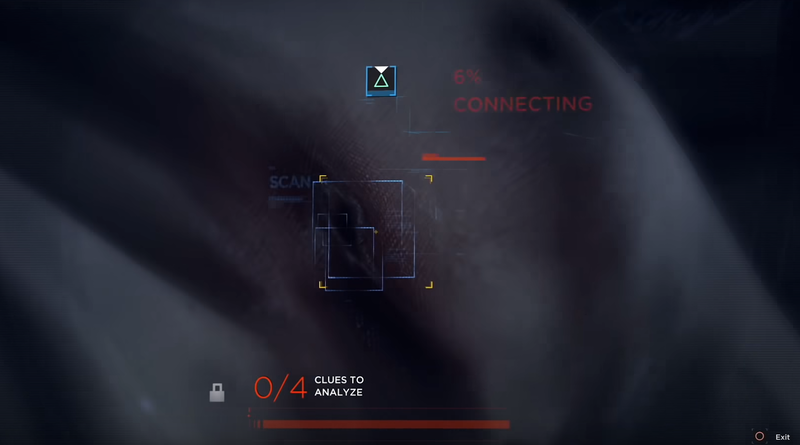 In Heavy Rain (2010), Quantic Dream’s earlier game, the only way to figure what you can and cannot interact with is to carefully check your surroundings and see if an interaction icon pops up. There are some objects that signal pretty clearly that you can interact with them, such as a corpse at a crime scene that you are able to examine. A design goal for a game should be to be able to use your intuition to figure out what sort of items you ought to be able to interact with – but the Heavy Rain never lets you train that intuition. Obvious objects are more an exception than a rule, and thus the player’s optimal strategy ends up being doing a brute force search of the room to try and locate all the hotspots. There are two main issues with not being to identify points interaction. The first one is that it lessens the game’s sense of immersion. The second is that it doesn’t allow you to properly “play” the game. Detroit has some tricks up its sleeve to reduce both of these, but before we get into that it is worth to discuss just what is so problematic with these issues. Let us first go over the issue of immersion. In order for a player to feel immersed in an environment, they need to internalize the surroundings. This is something I have covered in other posts, but basically it means that players need to actively take a part in the fantasy. And in order for a player to feel present inside a virtual world, they need to have what is called internal representation. While it may not seem like it, real life also operates on internal representation. You don’t simply “see a chair”. The act of seeing a chair triggers all sorts of data about chairs: what their physical properties are, what you can do with them, what are your available actions and so forth. All of these combine into the actual sensation that there is a chair in front of you. Here comes the issue. If you play a game where looking at a chair lacks any situational data, the player’s mental representation is empty. They fail to build any vivid fantasy for the virtual scene that the game tries to build. In turn the player is unable to place themselves, as in their actual selves, inside the game world. When games fail to take this into account it results in a world that doesn’t feel very immersive. Secondly, the gameplay issue with affordances is that the player lacks the ability to plan. I have gone over player planning and why it is so important for good gameplay in a previous post, but let’s do a quick recap: we don’t play games by just reacting to stimuli that the games send our way – instead, most of the gameplay takes place inside our heads. We survey our environments, go over long- and short-term goals, and decide what set of actions are the most optimal to reach said goals. The longer and more accurate plans a game allows the player to make, the better it will feel to play. As a clear example, let’s compare a moment playing Dragon’s Lair (1983) to a moment in Civilization (1991). Civilization is filled with possibilities and room for planning. 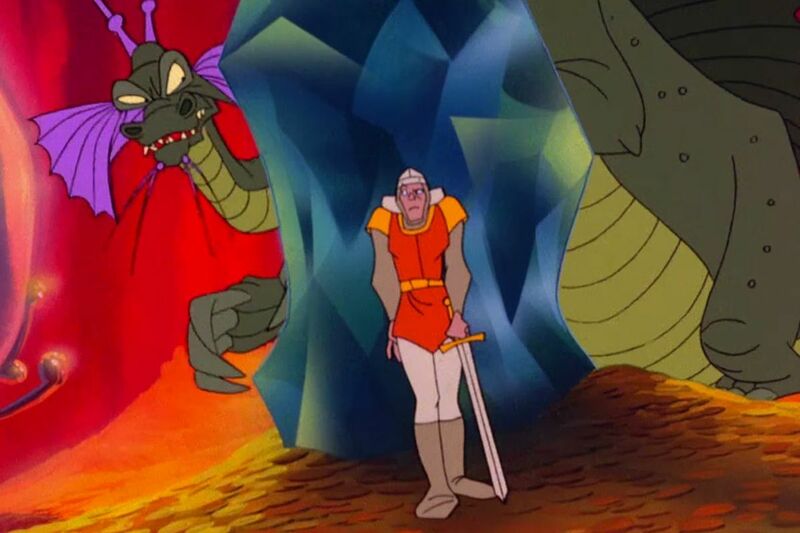 Dragon’s Lair on the other hand is just a linear path where you can only get good by memorizing a specific sequence. This is not the most fair example, but should illustrate the primal differences. Games like Heavy Rain and Detroit, as well as classic adventure games, rely on putting the player in a real-life situation and making that the core of planning one’s actions. Taken at face value, it’s somewhat easy to understand what your options are when trying to find shelter for the night, because it is all based around elements that we know from real life. It’s much harder to know what to do during a laser-wielding vampire bat robot attack. The issue is that the real world is incredibly complex, and a game cannot possibly recreate all the alternatives that a person could think of. This means that even though you might intuitively make up a certain plan, you can’t be sure whether the game will actually support it or not. The main trick of Detroit, and Heavy Rain before it, is to simply make each scene feel like a movie scene. It gives the player a feeling for how the scene ought to evolve next, and how the character(s) ought to react. So the player gains their affordances not from how they view the scene, but how they imagine the characters (and to some extend the director) doing it. On top of that, the very cinematic structure pushes a narrative that makes up for the lack of immersion. The player’s feelings here depend a lot on how they play the game. If they play as if they are the protagonist, these problems can become quite severe. It is a lot less damaging if the player views their role as a director. Then they are distancing themselves from the game and viewing the whole experience differently. Most of the discussions I bring up in this post are mainly centered around the former playstyle where you actively take on the role of a certain character. Therefore, imagining yourself as the character in Quantic Dream games doesn’t really hold up – especially when the player is supposed to have a more lengthy interaction. In Heavy Rain it is easy to fall into optimizing behaviour and do brute force search to see what you can interact with. This sort of searching turns what is supposed to be a realistic environment into an abstract play field. Heavy Rain also has real trouble giving you a sense of your options. So, most of the game is played based on moment-to-moment reactions rather than deliberate planning. More Dragon’s Lair than Civilization. It is clear that Quantic Dream know about these issues, as Detroit does quite a lot of things to try and fix this. The two major ones are explicit hotspots, and quest lists. The hotspots that pop up make it feel like a “batman mode”, where the time stops and the environment gets a line-mesh overlay. When in this mode, all nearby possible interactions display glowing icons. On top of this, all of the character’s short term goals are displayed as well, including those that haven’t been unlocked yet. Detroit also shows various goals, and even characters’ feelings, as big in-world text throughout the game. This gives the player a better idea of what they are supposed to do, and what are the available tools to achieve their goals. The problem is that these new features don’t really try to fix the underlying problems of affordance. They are more like crutches, propping a flawed system. In a perfect world, these systems should be used as a sort of tutorial for the player. Once they get a better sense of how the game works, they should be able to stop relying on them, and instead rely on their intuitive understanding. What happens instead is the opposite. The further you get into Detroit, the more prone you get to use these systems. In my playthrough of Detroit I used the “batman mode” quite sparingly for the first few hours – but as time went on I used it more, to the point where I almost stopped trying to intuitively parse the environment at all. Why? Because if I didn’t use it, I was more likely to miss hotspots and tasks, and therefore not get everything I wanted from the scene. In the end, this style of play actually made me plan more. But all of this planning was happening in an abstract realm. I was playing a game of “choose from explicit options given to me by the game’s designer”, rather than actually making decisions based on the world that was presented to me. This often lead to weird situations where I did tasks that I didn’t know existed (eg. go look for a bag I didn’t even know was there). Worse still, it made me act less like the characters I was supposed to be playing as. Detroit features a fair bit of detailed crime scenes that I was supposed to search, but because of the crutches I never tried to analyze the scenes as an actual detective. Instead I was simply searching for abstract hotspots. To make matters worse, the game often told me just how many hotspots there were to find, making me feel and thing even less like a detective. The important takeaway here is just how important it is to find a way to create a game that actually makes the player engage in the game as it is. Detroit is not the only game that uses this kind of crutch, it’s quite common. And it is not always bad, either. For instance in Metal Gear Solid you have exclamation points pop up over soldiers’ heads when they spot you. However, they key difference here is that it adds information to the scene that is already in front of you. There are actual character models, sounds and so forth that play into the scene. When you try to design crutches, you need to make sure that they supply something extra to the fantasy. They shouldn’t act as a substitute for the game’s actual world. It might seem like I didn’t like the gameplay in Detroit – but the fact is that I found it quite engaging. I think this is really interesting. Despite all of the apparent flaws in the system, it still felt like I was part of the narrative. This was especially true for the detective work. The same was also true in the 2018 Call of Cthulhu game. There the detective scenes were even more simplistic, almost like playing a basic “hidden object” game, and yet I found them strangely compelling. How is this possible? I think a lot of this is in line with the 4-layer approach that I’ve written about before. The foundational thinking with the 4-layer approach is that when you put any gameplay in the context of story, doing that gameplay feels like playing a story. Detroit does a lot of things right when creating this sort of merger between systems and narrative. First of all, Detroit is very good at setting up the context. A scene always starts with some sort of cutscene (“cutscene” feeling like a weird word in an interactive film game, but working as a distinction in this context), that lays out the story reasons as to why you are doing the investigation. So when you are essentially searching for hotspots, the whole setup makes it feel as if you are doing detective work, even if you are not mentally embracing the detective role. Secondly, when you find a hotspot, you always get information that has something to do with the narrative. The actual value of the information varies a lot: sometimes it’s useful and sometimes it’s just techno babble. But in all cases it feels like narrative feedback. 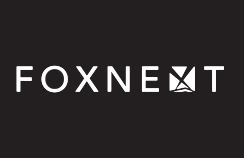 When this is combined with the explicit – and very gamey – feedback that says you just found one of the three clues, it feels more like progressing a case than fulfilling abstract game requirements. Finally, when you manage to find all the clues, the abstract (game-y) accomplishment always comes with some sort of narrative reward. For instance when searching a corpse, you get to view a reconstruction of what happened to this person. In many other cases you may unlock a new dialog option. And in every case you feel like completing the tasks makes you progress the narrative. So, even though the gameplay is abstracted, you still feel like you are inside a story. On the surface all of this feels a bit like cheating. But I think that’s the wrong way to look at it. Instead it’s something to be embraced. In fact, on our journey to progress the storytelling potential of games as a medium, I am of the position that trying to do it without any form of “cheating” is a dead end. All entertainment is based on fooling your audience. Illusion is an essential part of the craft. The trick is just to cheat in such a way that it goes unnoticed. What feeds into this illusion is the fact that humans tend to be bad at understanding why they’re feeling something. As an example: one tends to find a potential partner more attractive when drinking something hot while around the person. That is because hot drinks activate responses similar to arousal, eg. increasing the blood flow. The brain just tends to attribute these responses not to coffee, but to the potential partner, tricking you into thinking you are feeling aroused. In a similar manner, when you feel accomplished for finding one of the three abstract hotspots, that feeling gets entwined with the detective narrative. These two parts get mixed into a single whole, and that whole becomes a compelling experience. It is worth to note that both sides can help the other. The narrative makes simple gameplay feel exciting, and the feedback on the other hand can make flawed narrative feel compelling. It is larger than the sum of its parts in the purest sense. You can get an especially good sense of how this two-way feedback works when the system starts breaking down. I find that this can happen quite a lot in Detroit’s action sequences. There the narrative stops being the focal point, there are less narrative rewards upon success, and the input gets less clear (as it is merely about split second reactions). As long as the goals and actions are easily identifiable, eg. hiding and closing a door, the narrative-system symbiosis remains in place. But once it turns into blocking and returning punches, the player (or at least I) get distanced from the action. It becomes more of an abstract challenge than a piece of interactive storytelling. So in a way, the increased abstraction actually works for Detroit’s benefit. By showing some numbers going up, and clear objective pointers, the game manages to add a more concrete feedback loop. As explained above, it also comes with issues, but also gives the game more opportunities for narrative-system symbiosis. Detroit uses the symbiosis to simulate all sorts of situations, often with quite pleasing results. What stood out for me was an interrogation scene with a stressed-out android, and a scene where I had to make sure a police officer didn’t become too suspicious of my character. The success of those scenes came from mixing simple, gamey systems together with narrative in a holistic manner. If you want to dig deeper into various ways to achieve this sort of merging of elements, Detroit is an excellent case study. Since the scenes featured are quite diverse, the ways of combining systems an narrative vary, and the results vary along with that. While there are many interesting aspects about the game, it does have lot of room for improvement. I want to discuss that a bit. Detroit relies heavily on increased abstractions (such as the aforementioned hotspots and objectives), and I don’t think that’s the right way. I find it better to try and achieve the same kind of affordance by using a story-like world. It is not the abstraction per se that allows to combine systems and narrative, but the player’s understanding of cause and effect. Using abstractions also comes with a lot of issues. In my opinion, the biggest issue is the negative effect on immersion. If the world the player navigates is just filled with simple, systems-specific abstractions, the player can never transport themselves into the world. At best, the actual rendered world (environments, characters etc.) just becomes narrative background. Instead as a designer, you want the world’s elements to be what the player uses in order to be an active part of the game. The aim should be for the player to gaze at a rendered scene, and have a mental model of all the interaction points and how these can be used for various plans, as I have written earlier. ...to a scene in Super Mario Bros. In Detroit, I am not sure what things I can interact with, nor how they would affect me. From just looking at the world as-is, it is impossible to make any sort of concrete action plan. 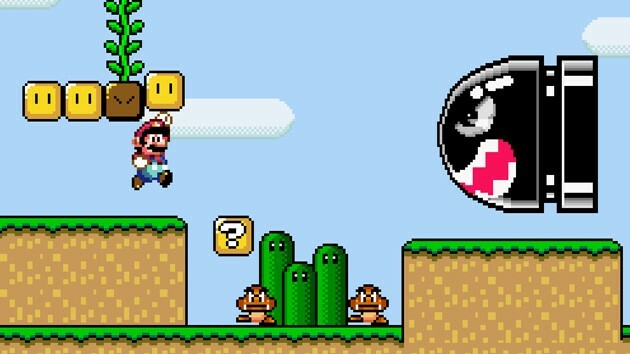 On the other hand Mario is very accessible, at least to anyone who has ever played the game. You can easily see every object, imagine how you can interact with it, and plan your progress accordingly. The sort of readability that a Super Mario game has is what you want as a game designer. The thing to learn from Detroit is that you don’t need incredibly complex actions in scenes to create an engaging narrative. In fact, the actual gameplay can be simple and “dull” – as long as you are able to combine it with a narrative. However, there would be a huge difference if the interactions you partake in are grounded in the game’s world, instead of just being abstractions. There are obviously other things to improve, especially the player’s ability to plan. But as a first step, I think having Super Mario level of affordance in the game’s world would be a huge improvement. Now before I end this article, there are two more topics I want to cover. The first of these is branching. Before making Detroit: Become Human, Quantic Dream made Beyond: Two Souls (2013). This game took a slightly different approach to the idea of a game as an interactive movie – especially when it came to branching. The game’s story had a ton of different ways to play out, but as recounted in this article by Press X to Story, it went mostly unnoticed by players. It feels like Quantic Dream really reacted to this because damn, they are now really pushing the branching angle. There is a node tree at the end of each scene, there’s visual cues when conversation subjects unlock, there are lists of things you could do, the latter scenes obviously change, and so on. And it really does feel like the open story and the branching matters. Especially interesting are the node maps. In the maps, all the choices you could have made are laid out, but the ones you didn’t make in your current or previous game are blanked out. At first I really didn’t like it, but the more I played the more it grew on me. It seems like it had a certain ad-hoc effect, and I can still sort of feel it. Remembering a scene often feels cooler than actually playing it. To me, the Detroit showing you potential paths I could have taken make my choices seem more compelling, when viewed in retrospect. This might feel a bit like a cheat. But as discussed before, cheating is how entertainment works. Still, a part of me wonders if Detroit could have handled it in a more subtle way. Sometimes it felt like too much to get all the possible courses of events shoved in my face. I would have liked it if the would have treated the overall branching as it did the special dialog and changes in scenes. But at the same time, I wonder if that would have given across the feeling that the story was indeed open-ended and had tons of options – as Beyond: Two Souls failed to convey. The best way to get away from the trap of being overly explicit is to, as explained above, up the level of affordance. In a perfect scenario, the player should know about the ways the scene could have gone simply by having mentally analyzed the scene. For instance, Civilization doesn’t need a node map at the end of a round for the player to know that there are many other ways things could have gone. This is not the most fair comparison, as I don’t think it’s possible to make a storytelling game that is as systemically driven. But it does give you a sense of what sort of feeling games could strive for. Given that Detroit deals with a few themes similar to SOMA, it feels like I need to say something about Detroit’s themes to close this off. It would be too much to go over all aspects of the game, so I will just focus on one: robot and human similarities. I think the game would have been a lot more thematically interesting if the robots didn’t look so human. Instead I think it would have been much better if they looked like the robots from the movie I, Robot (2004), or perhaps something out of the Boston Dynamics lab. Right now it’s just too easy to sympathise with the robots. It would be much more fun if the player started the game thinking the robots did not deserve any rights, and the thinking would evolve throughout the game. The robots’ thinking is also too human. Again, it would be much cooler if they felt more alien in how they handled their emotions and so forth. There is actually less neurodiversity between humans and robots in Detroit than there is among real humans overall. For example, right now it doesn’t make much sense for a player to want for Connor to stay an obedient robot. 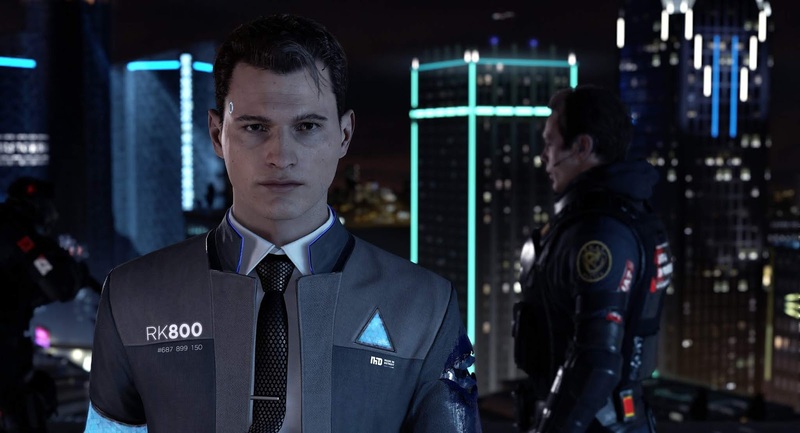 The story pretty clearly pushes the player to want Connor to become a deviant (a robot free from human masters). If the Connor had looked a bit more spooky, or had weirder ways of thinking, it would have made the choice less obvious and forced me to think more about my alternatives. It would also seem weird that people would want to buy servants that look so human. People can already feel bad for a Roomba, let alone something that looks like a fellow human. It would make more sense for the robots to actually look like robots. I know that Quantic Dream wanted to show off their facial animation tech, and make sure it was easy to relate to the protagonists. But the point stands: a version of Detroit with robots that are clearly not human would be damn interesting to play.